Nine days after the King’s Own Scottish Borders shot dead four unarmed Dubliners and wounded about forty more on Bachelor’s Walk, John Redmond, without consulting either party colleagues or the Irish electorate presumed to commit Ireland to war on Britain’s behalf against Germany and the Hapsburg Empire, in alliance with Serbia, whose agents had murdered Archduke Ferdinand and his wife in Sarajevo. At the first opportunity Irish voters repudiated Redmond and his party and endorsed the Insurgents of 1916. 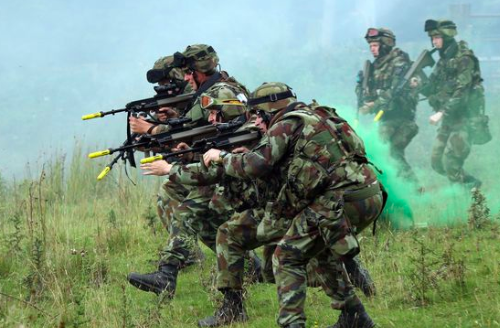 I would repeat the question today, having read that Leo Varadkar, who is Minister for Defence as well as Taoiseach, plans to triple defence spending from One Billion Euros to Three Billion Euros per annum. What country is poised to attack the Twenty Six Counties? What power are Oglaigh na hEireann (Parkgate Street) going to conquer on Leo’s orders? Has Dail Eireann even discussed the question or is Leo planning to follow John Redmond’s example and unleash a war on a whim? Will our warriors borrow the marching song “Blue Bonnets O’er the Border” from the KOSB and substitute “Blue Shirts O’er The Border” ? Or will there be a reprise of O’Duffy’s Spanish Crusade ? Farce repeating iiself as Farce?